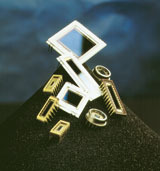 The SiTek standard position sensing detector. The SiTek Standard PSD (Position Sensing Detector) has high resolution, fast response and outstanding linearity. It is used in a wide variety of applications, most of them utilizing light sources in the visible or near-infrared part of the spectrum. The spectral range covers the region 400 - 1100 nm. Thanks to SiTek's proprietary AR-coating, optimized around 860 nm, a reflection loss of only 2% is achieved around the responsivity peak. Most of the detectors have a cover window to avoid handling damages. The UV PSD is a detector optimized for use in the UV wavelength region 200-400 nm, although its spectral response reaches up to 1100 nm. The sensitivity in the UV region (200-400 nm) is extremely high. The UV-PSD has the same outstanding specifications as the standard SiTek PSD. The performance data of the SiTek PSDs conform to the highest standards. The device specification data are measured in a well-defined environment but are also proven to be perfectly adequate in widely diverse environments, including those of an extremely demanding nature. Position non-linearity and thermal drift are measured within 80% of the detector length. Thermal drift is measured from 23°C to 70°C. All values are typical unless otherwise stated. For detailed data, please refer to individual data sheets.